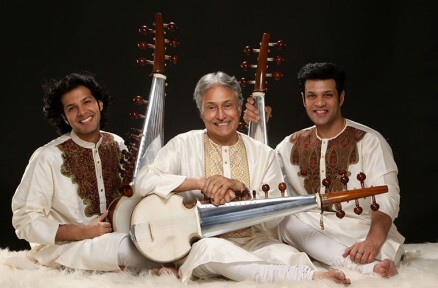 A new project of sarod maestro Amjad Ali Khan, widely considered today’s greatest sarod (lute) player whose legacy goes back six generations and who’s ancestors have developed and shaped the instrument over several hundred years, and his sons. This concert in three segments features a sarod solo represeting music from different regions of India and the Middle East; a sarod duet by Amaan Ali Khan and Ayaan Ali Khan; and a sarod trio joined by two consummate percussionists, Issa Malluf on Middle Eastern percussion and Anubrata Chatterjee on tabla. The artists will perform North Indian classical ragas on the sarod, a stunning fretless stringed instrument able to produce swooping melismatic slides between notes by using strong pressure of the long metal fingerboard.